Libochovice is situated at an elevation of 166 m at the river Oh&rcaron;e (Eger) in the Litom&ecaron;&rcaron;ice district of the Ústí nad Labem region in northern Bohemia. Lubochowicz was first mentioned in 1282. 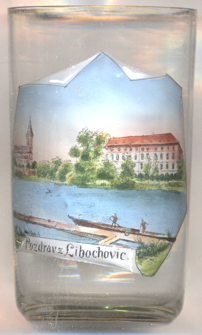 In 1507 Libochovice obtained the privilege to hold markets, further privileges were given to it in 1591. 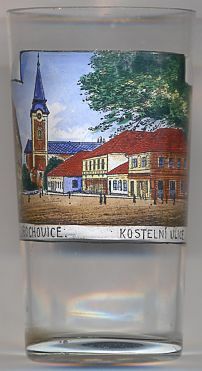 In 1850, Libochovice became the seat of a district court. The railway line from Libochovice to Lovosice was opened in 1882, the line to Louny followed in 1902, and in 1907 that to Jenišovice un Jablonce nad Nisou. The district court was moved to Lovosice in 1949. The Catholic deanery church of All Saints (kostel Všech svatých) [left] was built in 1700–1705 in place of an earlier, Gothic church. Libochovice castle [right] is one of the most important early Baroque castles in Bohemia. Its origins go back to a simle wooden fort, built here on the left bank of the Oh&rcaron;e river in the 12th century. In the 14th and early 15th century it was rebuilt as a Gothic stronghold and residence castle. However, nothing remains of that early structure as it was burnt down during the Hussite wars. The castle was rebuilt as a Renaissance residence in 1560–1564, its chapel was still built in late Gothic style. Destroyed by a large fire in 1661, the castle was finally rebuilt in early Baroque style in 1683–1690. The architect was Antonio della Porta, who also built the new castle in nearby Roudnice nad Labem. In 1945 the castle was depossessed and since then is in possession of the Czech Republic. The castle park was laid out after 1685 as a French garden. In the 19th century it was enlarged by an English park. Both parts of the garden were renewed in 1912. Castle and park are open to the public. Libochovice is the place of birth of the important Czech physiologist Jan Evangelista Purkynĕ (1787–1869). A permanent exhibition of the life and works of Purkynĕ is located in the castle of Libochovice.